My initial trial of Caputo 00 Chef’s Flour intrigued me, but it certainly didn’t solve the issues I’d faced with doughs in the past. 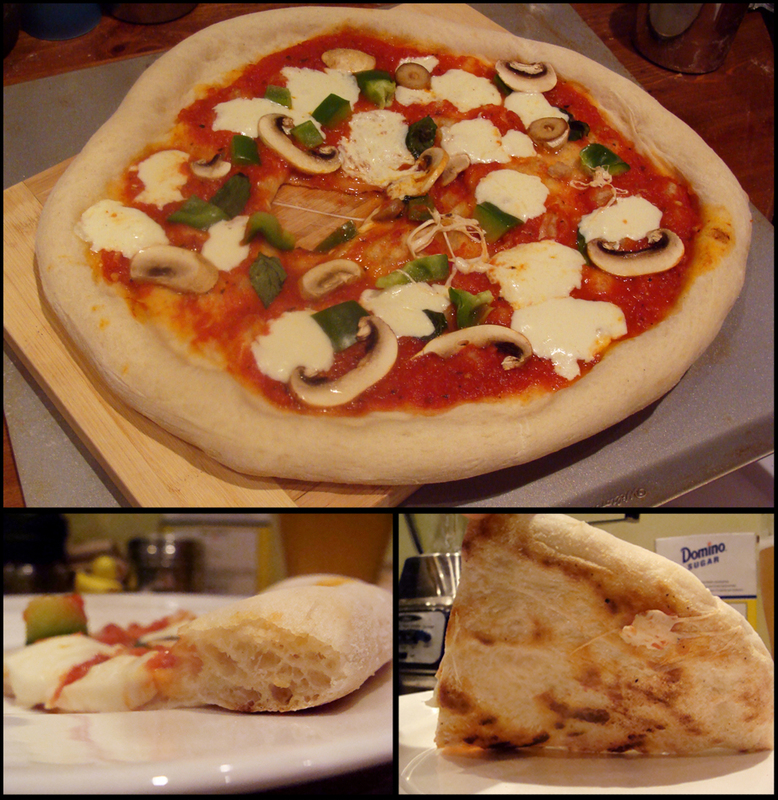 My Caputo pies came out pale (although they had no oil or sugar, so a direct comparison with past pies is not really fair) and tough while my King Arthur Bread Flour (KABF) pies have had problems with too much extensibility and not enough elasticity in the dough, resulting in spots where the pizza skin is stretched too thin or tears. 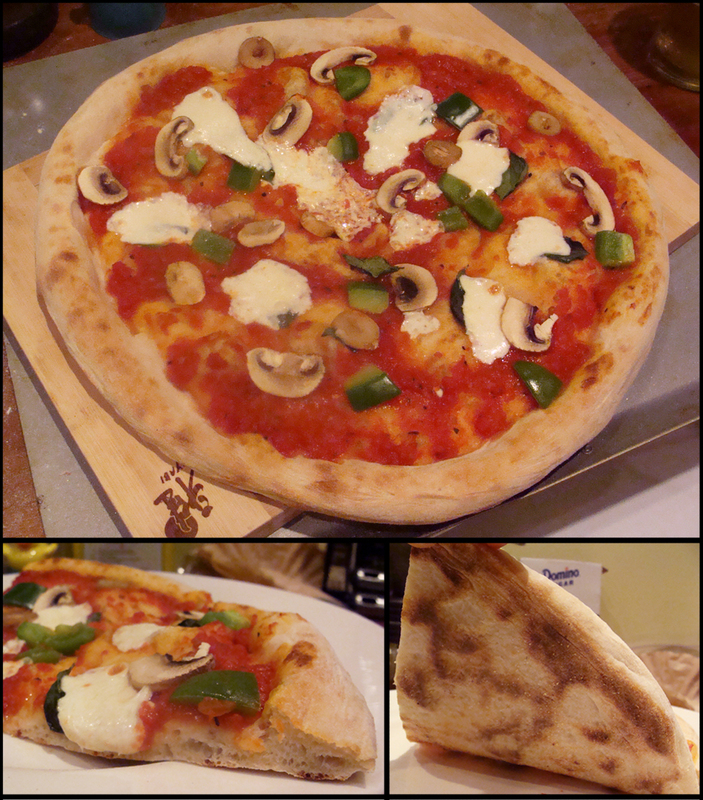 Lately with all of my doughs I’ve been having issues with too much bench flour making it onto the finished pizza. I took my issues to Pizzamaking.com, which has an excellent forum of pizza enthusiasts and professionals helping members make their ideal pizza at home. Tonight I try some of the tips and suggestions I received. I decided to make three doughs following roughly the same recipe, but using different ratios of Caputo and KABF, hoping to really tease out how these flours differ in dough handling and in baking. One dough is all KABF, one is a 50/50 mix, and one is all Caputo. I used 9 ounces of flour for each ball, and hydrated the flour at 62%, 60%, and 58% respectively. The hydration levels are similar to the rated absorption of each flour. Each dough also contains 2% salt, 2% sugar, and 2% oil. 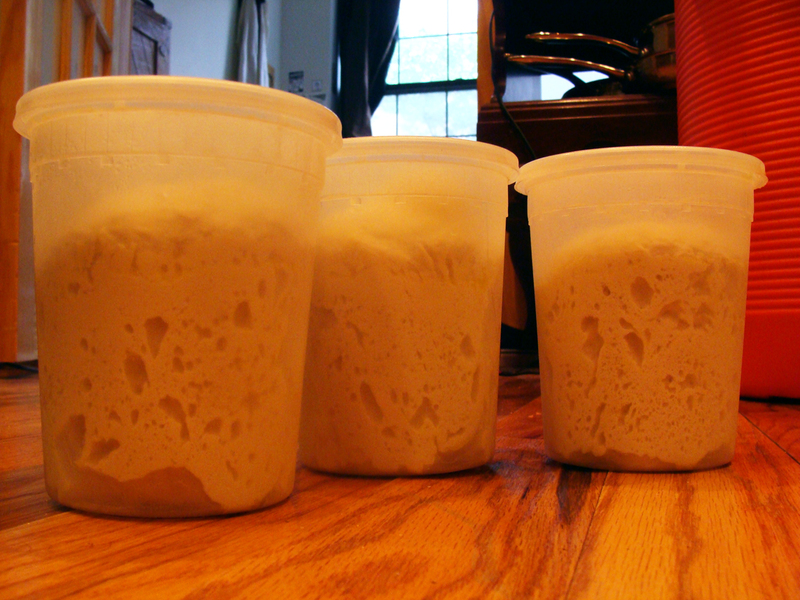 I fermented with 1.5% IDY in plastic quart containers placed in the fridge for 24 hours, followed by balling the dough up and proofing it for four hours at room temperature. As a note, the IDY content was a mistake – I intended to use .15%. I also wanted to use a 48 hour cold ferment, but simply didn’t have time because I was at the Homebrewers Guild meeting when I would’ve had to make the dough. I plan to replicate this experiment again next week with these factors amended and will update this post with any changes in the results. The doughs rose much faster than previous cold ferments, likely because I accidentally used about one-third more yeast than those doughs. However, the final volume was similar to what I expected. When I shaped the doughs into balls for the four hour proof at room temperature, they felt a bit dry and stiff, but not unbelievably so given that they were cold and hadn’t fermented for very long. However, by the time they reached the make table, the hybrid and KABF doughs (which I made second and third) had large thin bubbles forming at the surface, and the doughs felt a bit weak and floppy. One of the tips I received was to put the bench flour on a plate rather than the make table. That way you can flour up the dough ball and slap or brush some of the flour off before the dough is stretched and therefore before there is a risk of ripping the pizza skin. 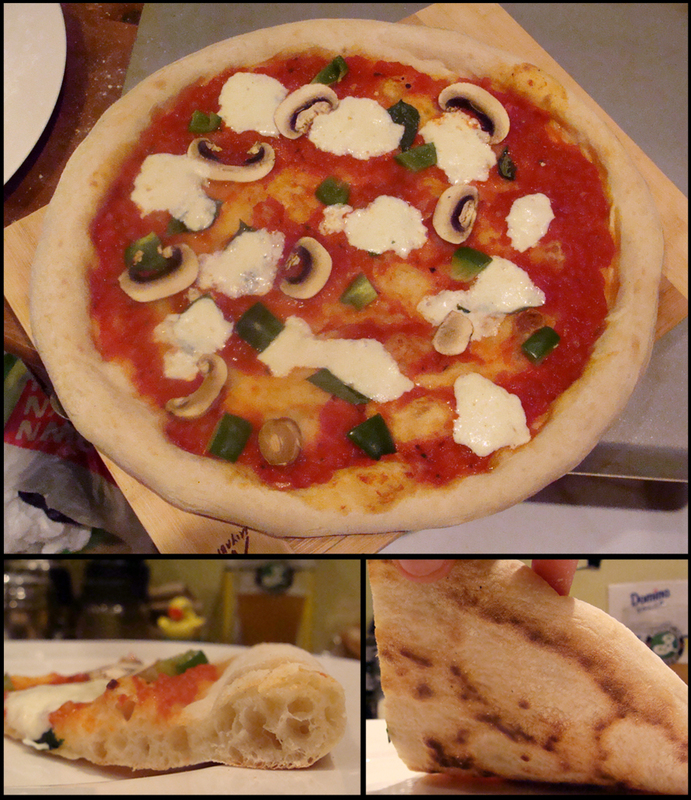 This tip worked wonderfully, and not a single pizza had excess flour on it coming out of the oven. As a bonus, the leftover flour can easily be recovered once you’re done. I used Caputo flour as my bench flour. Yup, that’s a hole in the center of the pie. I still struggle with stretching out the skins, as this purely Caputo pie attests. After stretching the dough balls into pizza skins, I’d lay them onto my peel, which was dusted with a 50/50 mix of Caputo and cornmeal. I’d then top them, and launch them onto the steel. There was a slight mishap where a hole opened up in the Caputo pie, but I think that was due to over-stretching the dough rather than an error while launching the pie. While the dough got too thin in the middle, it was a little thick near the cornicione, even though all of my stretching was done right near the rim. The hybrid pie made of half KABF and half Caputo. The broiler didn’t cycle on, and I had to pull the pie out of the oven so the bottom didn’t burn, so the top didn’t brown as much as the KABF pie. I didn’t notice much difference between this and the KABF pie. The pies all came out very similar, and in a blind taste test handled by a more skilled pizzaiolo than myself, I would be hard pressed to tell the difference. You can see in the photos that the KABF pie was the most browned, but I think this was simply an artifact of inconsistent use of the broiler. For the Caputo pie, since the skin tore on the way into the oven, I rushed about turning on fans and opening doors and windows to prevent the smoke alarm from sounding, and missed my mark on the broiler. For the hybrid pie, when I turned on the broiler, the element didn’t light for a minute or more. The Caputo pie was a little more tender and the flavor had developed a bit more, but the effect was slight and may not been due to the flour. The pizza made with only KABF. The top wasn’t browned as much as I like due to difficulties with the broiler, but this is still pretty similar to higher hydration KABF pies I’ve made before. As for my usual pie problems, at least progress has been made on the bench flour front. I still struggled with the texture not being crispy enough on the outside or not achieving the right balance of chewy and tender on the inside, though trying a slightly lower bake temperature or getting more practice with the broiler could fix that. I also would like to try again with a longer fermentation at this same hydration level. I did notice that my oven spring was much decreased compared to my higher hydration doughs. Hopefully more work with the hydration and fermentation will eventually resolve the stretching woes, the texture, the oven spring, and even the browning to some degree. Even trickier still will be working out these variables as I move to making pies in a skillet rather than on my steel in order to avoid the heat of the oven in the summer. This entry was posted in experiment, learning, pizza, recipes and tagged dough, fermentation, flour, narrative on May 23, 2013 by Dylan Bargteil. If I’m not mistaken, using hydration ratios in the 60’s means your dough will need a very high heat in order to get proper texture and color. 700-800 degrees. Looks like you’re using a home electric oven which would explain the paleness of the crust. Try lowering the hydration. It’s true that home ovens tend to operate at much lower temperatures than their commercial counterparts, and so similar dough formulations won’t get the same coloring in the home. However, I think all of the pies came out pale that night simply because I hadn’t turned on the broiler early enough. I was baking them on a preheated slab of steel, and the bottom cooked so fast that the broiler did not have a chance to produce color on the top of the crust.